HAVE YOU EVER HAD A NEW YEAR RESOLUTION THAT YOU DIDN’T STICK TO? OR MAYBE STARTED BUT LOST THE MOTIVATION AFTER AMONTH OR TWO? DO YOU WANT TO MAKE LONG LASTING CHANGES THIS YEAR? Resolutions I frequently hear include “I’m going to exercise for 30mins everyday” or “I’m going to remove all sweet snacks from my diet”. I encourage all endeavours to improve one’s health and wellbeing however too often I see these efforts fading over time. January gym goers lose their motivation by February and those sugary treats thrown out after New Year’s Eve start to creep back into the pantry. I’d like to share with you my ideas on how you can effectively turn your new year resolution or dream into a goal that you can measure over time. Taking the first step is one of the hardest parts, however if you have already started moving more or eating healthier high 5 yourself for moving in the right direction! Often the most difficult part can be keeping the motivation up as time goes on. There is a parallel relationship between motivation and the size of the change being made or difficulty of the task. For instance the bigger the change you make, the higher your motivation levels have to be to achieve the new you. In contrast, the smaller the change the less motivation, time and energy required. An example where I have applied this method myself is with my morning wake up times. In the past nothing much would ever get done after I returned home from work so in an effort to become more productive with my time, I decided 3 months ago to get up earlier. The resolution, dream or long term goal for me was to wake up at 5am on weekdays. Over the last 3 months I have consistently been waking up 5 minutes earlier each week and am currently getting up at 6.10am. The good thing is that I’ve been able to stick to this plan for 3 months without my body resisting to the behaviour change. I now know that in 14 weeks, on the 18th of March, I’ll be getting up at 5am, my body will be adjusted to the time and I won’t be falling asleep at my desk as the behaviour will be well ingrained. Some of you may be thinking…”Wow that progress is at a snail pace.Why not just wake up at 5am?” I acknowledge and congratulate those who can change to getting up 2hrs earlier, or start exercising for 30mins daily from nothing, cut out all processed sugar from their diet or go cold turkey quitting cigarettes. Your motivation is clearly persistent and very high allowing you to be successful. For the majority of people out there, I agree with BJ Fogg who believes that if you “Plant a tiny seed in the right spot, it will grow without coaxing.” I know if I was to set my alarm for 5am 3 months ago I may have stuck at the habit for a week and then given up believing that it is just too hard to wake up at such an hour. I see the same with my Exercise Physiology clients, friends and family who set out with great intentions to start exercising daily but eventually motivation starts to fade and the difficulty of exercising 30mins a day becomes too much. What if I asked you to aim for 7×10 minute walks per week at a moderate intensity? And every month you add 5 minutes to each walk? By the time May came around you would be walking 150 minutes a week which is the Australian adult physical activity guideline to maintain good health. I encourage everyone to dream big! I ask you to consider breaking down that dream into tiny parts, consistently building momentum as time goes on. What will your tiny habit be? How will it progress you towards your resolution? I would love to hear about your resolutions, tiny habits or any other questions you may have. I like the approach you set out in your Blog. You are a kind fitness coach who knows how to realistically work with people needing to get to a better place with their fitness. 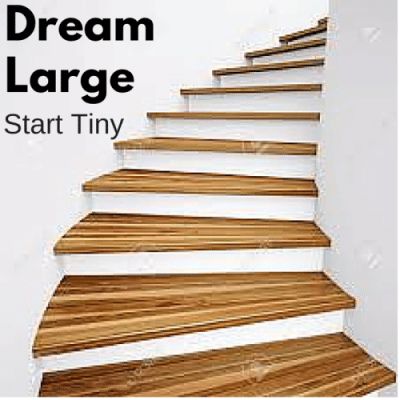 Your motto ‘Dream Large, Start Tiny’ is really good! Could you do me one favour? Use a darker (blacker) font in your blog page as I find the current one a bit hard to read on the grey background. Have a fun weekend, and remember to sleep in at least once for a change. Thank you for your feedback. I love the level of accountability you have created here. I believe this is a big reason for the progress you are making with your health so far on your Exercise Physiology journey. Until our next catch up, all the best with your exercise and Mimi. *I will look into using a darker font ASAP.